In “The Stolen Dragon of Quanx,” author Becca Mann takes readers on an imaginative adventure into a land of co-existing tribes where tribesmen are distinguished by their eyes. Their peaceful co-existence is threatened when the king of one tribe makes a decision that may have unexpected consequences. As the king's son struggles with the reality of his father's decision, across the land in another tribe, a fisherman's daughter has made discoveries of her own that could have far-reaching impact. As the paths of the two teens cross, they and two other teens are put on a quest to steal a dragon egg, and they must be successful or all of Quanx will be destroyed. "The Stolen Dragon of Quanx" is the first novel in "The Eyes Trilogy." Sixteen-year-old debut author Becca Mann has written a unique and compelling high fantasy story that includes humans and dragons battling for control of the land. In the land of Quanx, the good and the bad are not always set in stone, and careful readers will pick-up on subtle hints to show characters' true colors. The story is told from various characters' perspectives, which leads to good character development (some more developed than others), and a bunch of cliffhangers. Readers may find the main characters are unlikable, and they are definitely inconsistent in their actions, which frequently goes unexplained. Though they do experience some growth, by the end the group of teens still hasn't figured out how to work as a team and some are still quite self-centered. The main characters do seem to realize their own shortcomings and faults, but they don't necessarily care to adjust. It is a good message for being "I am who I am - accept me," however, the lesson of self-reflection and the need for self-improvement would be a great extension. Hopefully, this will be remedied in the next book. Author Mann does a great job with world building, including terrific descriptions of the landscape and lifestyles of each tribe. The most intriguing aspect of the lands of Quanx is that it is a world where eye color reveals every aspect of a person's heritage, and the eyes are the true identifier of every person. Mann's descriptions of the unique color combinations and even shape configurations in people's eyes were fascinating, and the concept makes readers think about a world where eye contact is so important. What could have used some explaining, though, was how the eyes trump the physical appearances of people. It was a stretch, for example, that a near sixteen-year-old female could simply cut her hair and be taken for a boy, not just visually, but after a pat down from soldiers checking her for weapons. 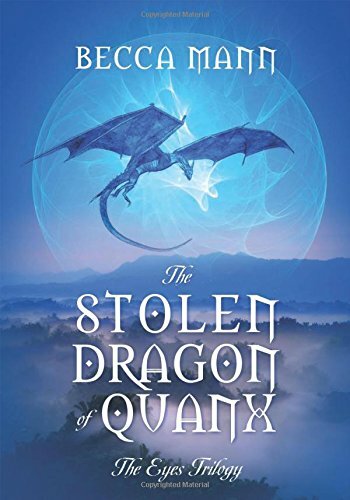 Overall, "The Stolen Dragon of Quanx" is a well-written, imaginative story that is action packed and full of twists and turns. There are few errors, and it's clear the book has been thoroughly edited for correctness. What it needs is a full edit for content to eliminate the too frequently used deus ex machina for solutions, the situations that rely too heavily on the suspension of disbelief, and the parts that are just too wordy. Despite the age of the main characters as older teens, this book is probably best for middle grade readers who will be more likely to accept the inconsistencies or illogical situations and enjoy the high fantasy aspect of the book. Becca Mann is a promising new author, and the sequel to "The Stolen Dragon of Quanx" will be worth a look.